We had the funeral today for Aly's Grandpa but also had to celebrate Isabelle's seventh birthday today too. After spending most of the day at the funeral, tonight we decided to go to the Cheese Cake Factory to celebrate. Grandma and Grandpa Ferran and DeAnn and Hanna went with us and after we went over to Build a Bear since we had some coupons to use. Isabelle's main present was a guitar, but not just any guitar, a pink guitar. She also got some footy pajamas that she has been wanting as well. 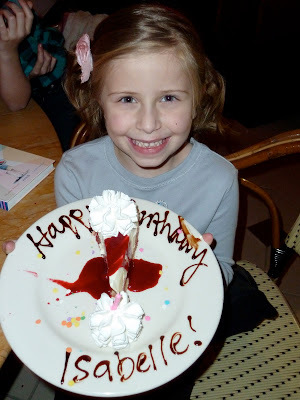 Happy Birthday Isabelle, I can't believe that you are already seven years old. Where has the time gone?